Certain areas of your lawn might have compacted soil, this condition can cause lawn irrigation / sprinkler water to run-off onto sidewalks or driveways without giving it enough time to seep into the soil. Adjusting the lawn irrigation / sprinkler watering schedules and times for individual irrigation zone area will alleviate some of the issues in the short term. Compacted areas can be a result of larger lawn mowers on the soil or heavy traffic areas that result in damaging compacted soil layers. 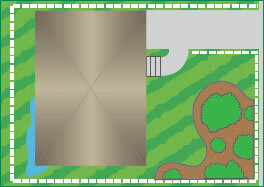 This can be resolved by varying mowing patterns and creating or moving the heavy usage area to a more suitable location on walkways or pathways. Often times simply these changes and aerating lawn areas twice yearly can resolve and correct these issues. Choose an easy-to-set controller for your lawn irrigation / sprinkler system with multiple programs and start times, or choose a controller with the Cycle + Soak option that allows the programming of multiple start times for shorter, precise periods of watering to eliminate run-off. Or use smaller lawn irrigation nozzles which deliver water at a lower rate; this allows sufficient soak-in time to prevent run-off. Smaller areas can be difficult to water, often lawn irrigation / sprinklers end up watering sidewalks, driveways or spraying against the house or garage. 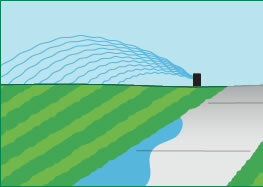 Low-volume lawn irrigation / sprinkler nozzles precisely water in a square pattern from 2.5 to 4 feet, which results in superior distribution control and uniformity to eliminate over-watering and wasteful run-off. Sprinkler zones with spray heads installed with van nozzles efficiently deliver precise, even coverage in smaller yards, any corner or odd-shaped area, or smaller strips of lawn.